There’s this term in art, typically used describing still life, of rhyparography. It’s a discipline that mostly is seen in some medium-poor light, as the term derives from a literal insult, meaning literally, a painter of mean things, or more cruelly, painter of dirt. More commonly it’s used to refer to representative art of fundamentally conventional, unremarkable objects. Some elements of hyper-realism in painting relate to this. Hyper-realism is a real as heck thing, by the way, and you can get a place to start looking by checking out the work of Pedro Campos. 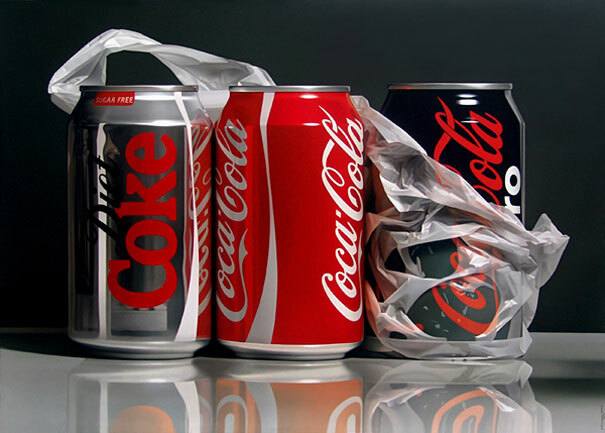 Artwork of three Coke cans, by Pedro Campos. The typical conversation about hyper-realism in painting is that it’s not rhyparography, because the point of hyper-realism is an effort to elevate the mundane object into a transcendant state. Rather, rhyparography is connected to the mundanity, the unexceptionality of the object. There’s also often some griminess to it – replicating dirt and smudges is a tricky thing. What interests me about rhyparography is its special presentation in games. Many games are about constructing worlds through visual media, which means that there are people who, in the making of games, construct incredibly mundane unimportant things, sometimes in huge variety. Anyone who’s done texture work or asset packs knows that you’re sometimes asked to represent a huge variety of just stuff. Much of it never gets noticed. Some of it never gets used. There are asset store packs full of unimportant crap. And they are all crafted. It is a thing to think about: How much of what we create in games is the normal, unimportant and unexciting. There’s a quiet beauty in that, knowing someone spent time and effort rendering a discarded coke bottle on a counter top, so you could walk into that space and feel like this is a real space.